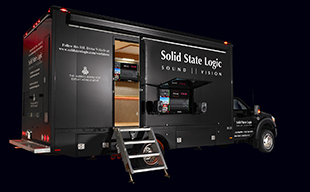 AMSTERDAM  Solid State Logic will feature the V4 Software for the innovative and industry-leading C10 HD Compact Broadcast Console at the IBC 2013 (Hall 8, Stand D.83). Demonstrated for the first time in Europe, the new V4 software release introduces a range of features and options that significantly expand the capability of the C10, representing the companys commitment to continuous improvement. The C10 turned the industry upside down by delivering exceptional power at an attractive price point, and the legacy continues with this new system upgrade. The winning formula for C10 is a unique combination of large console power and features delivered in a compact, affordable and extremely intuitive package. In particular, a range of automated features and simplified controls make the C10 adaptable to environments where users of varying skill levels will operate the console. The V4 Software release includes a range of great new features which significantly expand and enhance the appeal of the product. Highlights of the V4 upgrade include 'Function Key Macros,' a feature which reduces the number of physical actions required to achieve specific tasks by allowing multiple two state console switching functions to be grouped as a Macro and then actioned via soft keys, GPIs and fader functions. Another feature is HyperRoute, which makes the already superior SSL routing system even better. The C10 routing system uniquely allows operators to use a versatile source and destination group-based approach with operation from the actual control surface, rather than a separate computer. HyperRoute introduces an additional destination-based routing structure, which has the benefit of displaying destination source assignments without having to re-navigate through the source>destination path. The consoles new Assignable Delay Modules make integrating a wider range of external sources into live-to-air feeds quicker and easier. A total of 32 of the 64 available delays can now be routed anywhere, including Aux and Monitor inserts, or external I/O destinations that pick up internal or external sources as inputs. A new Control Surface Screen Saver extends the operational life of the console control surface by switching off all of the OLED displays and screens when not in use. SSLs Dialogue Automix feature has won widespread acclaim as the finest system available for controlling audio levels and maintaining consistent ambience in the fast-paced environment of multi-mic news and panel shows. A new Automix Overide function makes the best even better with an option to automatically close the pre fader feed to the Dialogue Automix system when the participants channel fader is closed. The maximum channel count available for C10 has been increased to 160 channels. The V4 upgrade also introduces optional new Wide Range 2 Band Filters, which add high and low pass filters to the channel signal path, expanding the channel EQ to become a full six-band parametric. The new Eyeconix Processing Display enables switching of the channel info displays to show EQ, Dynamics and panning graphs instead of Eyeconix images. The Eyeconix system has also been extended to make Eyeconix graphics available for ASG and PGM busses, aux and mix minus masters and DBA busses. A new Mix Minus Lock feature introduces the C10 to a new approach to creating and editing Mix Minus busses. In this new mode, all channels are initially routed to the Mix Minus busses; the in-channel Mix Minus routing buttons can then be used to exclude channels from each bus as required. A new Status Lock Function helps protect the Channel ON and/or PGM routing buttons from being pressed accidentally by requiring press and hold operation to edit them.